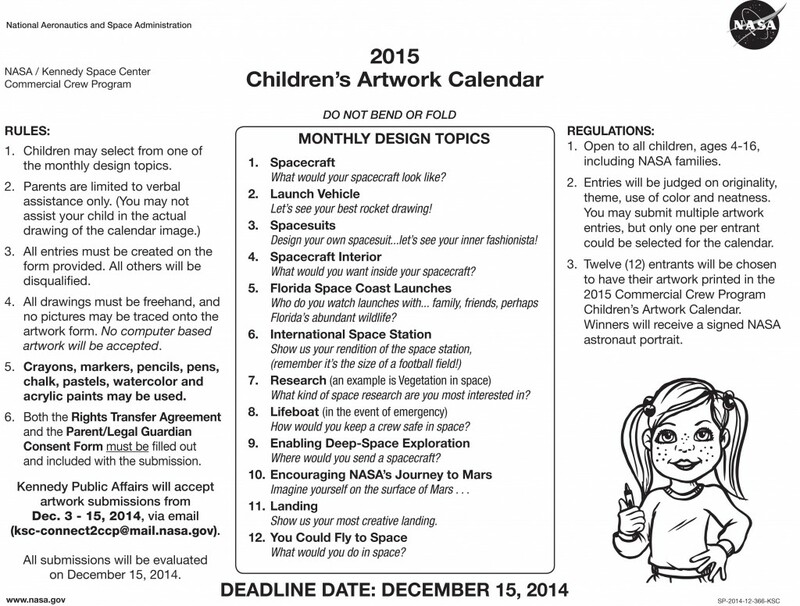 Hey Kids – Contribute to the 2015 Commercial Crew Calendar! We have some rules for submitting your drawings, so you’ll have to print out a few forms then fill them out with your parent’s help, scan them to send them back to us via email at ksc-connect2ccp@mail.nasa.gov. We’re also including a template for you to draw on, which will help us lay out the calendar. We’re looking for the best drawings in 12 categories, so get out your art tools and let your imagination fly through space with us! One last thing: the deadline for submissions is Dec. 15 at noon Eastern. Now the fun stuff, the categories . . .
1. Spacecraft: NASA’s spacecraft of the past had thousands of nobs and dials. Today’s commercial crew spacecraft will use touch screens, 3D printed seats and engines, and will be lightweight, but tough enough to withstand meteorites. What would your spacecraft look like? 2. Launch Vehicle: The commercial crew rockets that will carry astronauts to the International Space Station will be smaller than NASA’s previous Saturn V and space shuttle systems. Their missions are different, so their capabilities are different. Think of it like riding your bike to see your next-door neighbor, instead of driving a semi-truck on a cross-country trek. Let’s see your best rocket drawing! 3. Spacesuits: An astronaut’s spacesuit is like his or her own personal spacecraft. Commercial crew spacesuits will keep astronauts safe by providing breathable air and a cool temperature. They also will enable constant communication with people monitoring their health here on the ground. Design your own spacesuit . . . let’s see your inner fashionista! 4. Spacecraft Interior: Every spacecraft’s interior has been unique and advanced for its time. Apollo was very different from the space shuttle, and both are very different from the commercial crew systems that astronauts will use to fly to the International Space Station. Today’s spacecraft could feature tablet-like technology, 3D printed seats, Wi-Fi and much more. What would you want inside your spacecraft? 5. Florida Space Coast Launches: The rumble . . . the glow . . . the excitement! Every time NASA has launched people off the surface of Earth and into space, it has been from Florida’s Space Coast. In the next couple years, we will see commercial crew engines glow orange and plumes of smoke as astronauts again launch to the International Space Station from Florida. In the 2030s, we will also see astronauts launching from Florida’s Kennedy Space Center as they begin their journey to Mars. Who do you plan to watch launches with? 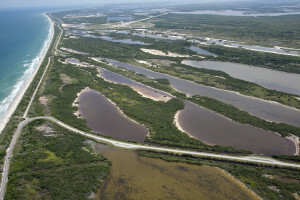 Family, friends, perhaps Florida’s abundant wildlife? 6. International Space Station: Look up! The International Space Station is orbiting about 250 miles above the surface of Earth, 24 hours a day, seven days a week, 365 days a year. On board, astronauts conduct ground-breaking research that helps us here on Earth. They also are learning what it takes to live for long periods of time in space, which will help them on their journey to Mars. Commercial crew will help add an additional crew member to the station, essentially doubling the research potential of today. Show us your best rendition of the space station, remember it’s the size of a football field! 7. Research: Every day, astronauts perform research aboard the International Space Station, which is commercial crew’s ultimate destination. That research makes our lives better here on Earth, helps us understand more about our own planet and prepares us for longer missions to Mars. What kind of space research are you most interested in? 8. Lifeboat: Similar to lifeboats on a cruise ship, commercial crew spacecraft that will fly astronauts to the International Space Station are designed to safely and quickly evacuate the station’s crew in an emergency. How would you keep a crew safe in space? 10. Encouraging NASA’s Journey to Mars: By encouraging private companies to provide human transportation services to and from low-Earth orbit – a region NASA’s been visiting since 1962 – America’s space agency will get the most research and experience out of the nation’s orbiting laboratory. Commercial crew allows NASA to expand its focus to build spacecraft and rockets for flights to Mars. Imagine yourself on the surface of Mars . . .
11. 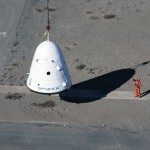 Landing: Spacecraft landings are quite impressive. After flying through space and re-entering the atmosphere at 17,500 miles per hour, spacecraft have to land smoothly to protect the astronauts and scientific research they carry. 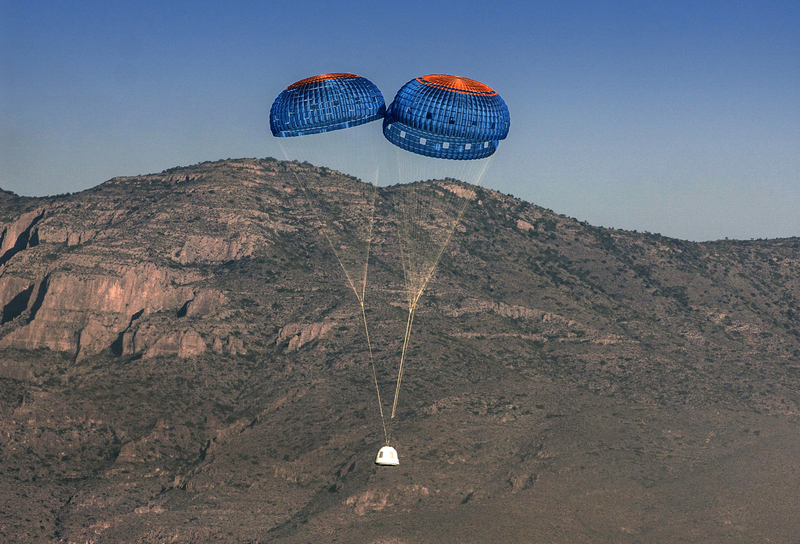 Commercial crew spacecraft designers are looking at options to land with parachutes and airbags, fly to a runway, similar to an airplane, or land using only rocket engines. Show us your most creative landing. 12. You Could Fly to Space: Remember when only astronauts could go to space? 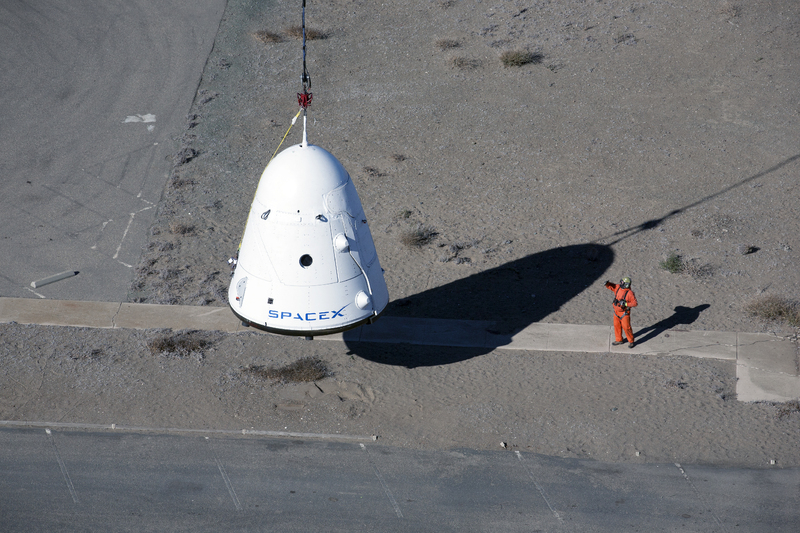 NASA won’t be the only customer for new commercial crew spacecraft. Companies will own and operate their crew transportation systems and be able to sell services to other customers . . . will you be one of them? What would you do in space? 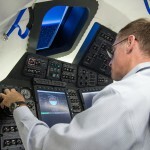 Author Steven SiceloffPosted on December 3, 2014 December 9, 2014 Categories Blue Origin, Boeing, CCDev2, CCiCap, CCtCap, Commercial Spaceflight, General, International Space Station, NASA, NASA Astronauts, Sierra Nevada Corporation, SpaceX1 Comment on Hey Kids – Contribute to the 2015 Commercial Crew Calendar! 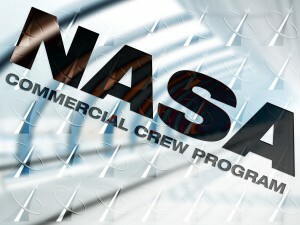 NASA’s industry partners completed and added new development milestones under agreements with the agency’s Commercial Crew Program. 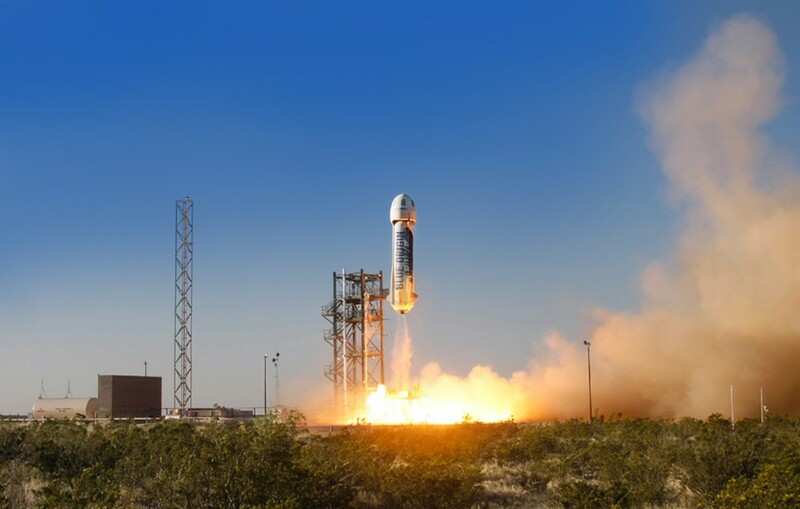 The work performed by Blue Origin, Boeing, Sierra Nevada Corporation and SpaceX during partnership and contract initiatives are leading a new generation of safe, reliable and cost-effective crew space transportation systems to low-Earth orbit destinations. Learn more about what has been accomplished and what has been added here. 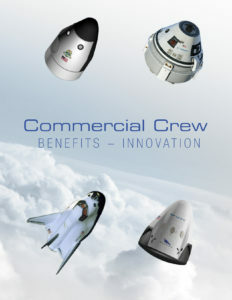 Commercial Crew’s Collector Card Family Expands! We’ve added two more collector cards to the Commercial Crew set! 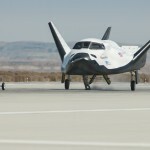 Blue Origin’s Space Vehicle and Sierra Nevada Corporation’s Dream Chaser join Boeing’s CST-100 and SpaceX’s Crew Dragon, along with the card for NASA’s Commercial Crew Program. All the companies are working in partnership with NASA to develop their respective spacecraft and are in different stages of agreements. The goal is to build and fly a new generation of spacecraft capable of carrying people to low-Earth orbit and the International Space Station from America in the next three years. It’s a great challenge on many levels, but combining NASA’s know-how with the industrial prowess of American aerospace companies puts the opportunity to create a new business system within reach. To download and print the cards, click on each of these links: Blue Origin Space Vehicle, Boeing CST-100, Commercial Crew Program, Sierra Nevada Corporation Dream Chaser and SpaceX Crew Dragon. For best results, use card stock and select auto-rotate and center and the two-sided option in your printer settings. If the two-sided option isn’t available, print page 1 and reload the paper before printing page 2. 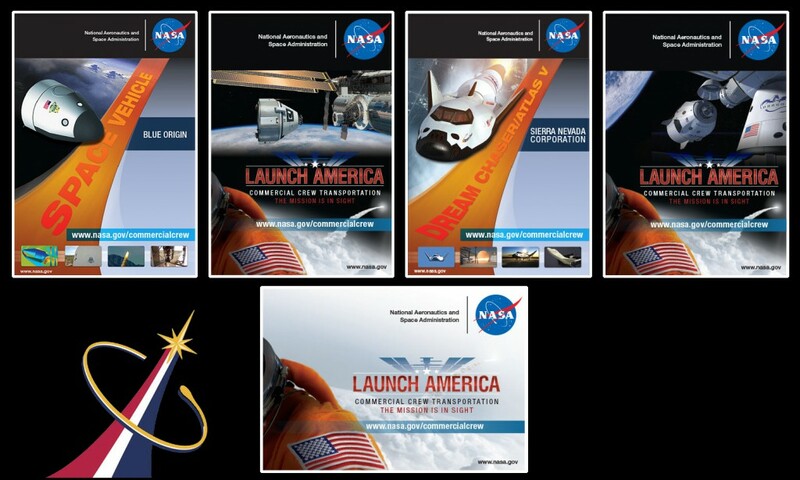 Author Stephanie MartinPosted on November 12, 2014 Categories Blue Origin, Boeing, CCDev2, CCiCap, CCtCap, Commercial Spaceflight, International Space Station, NASA, NASA Astronauts, Sierra Nevada Corporation, SpaceXLeave a comment on Commercial Crew’s Collector Card Family Expands! NASA’s spaceflight experts in the Commercial Crew Program (CCP) met throughout July with aerospace partners to review increasingly advanced designs, elements and systems of the spacecraft and launch vehicles under development as part of the space agency’s Commercial Crew Integrated Capability (CCiCap) and Commercial Crew Development Round 2 (CCDev2) initiatives. Read details of today’s news here. CCP @ 3: Happy Birthday! Light the candles because NASA’s Commercial Crew Program is three years old! 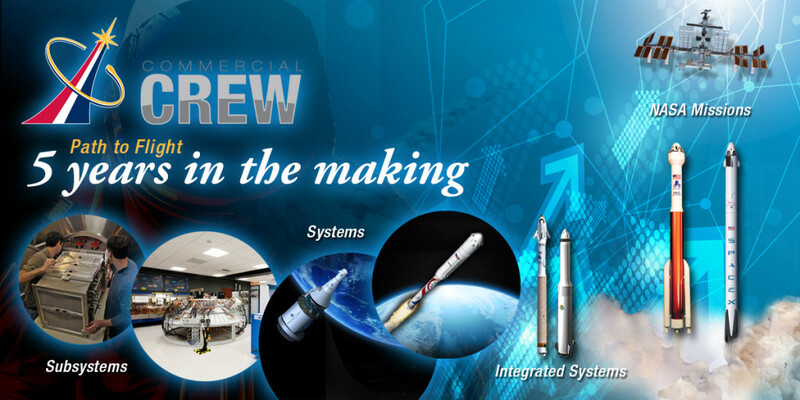 The past three years have seen CCP and its industry partners make huge strides toward crewed spaceflight. 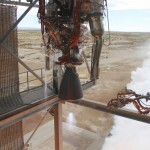 The by-no-means-complete highlights include, from left, Blue Origin’s testing of its BE-3 engine, Boeing’s software evaluations using its new CST-100 simulator, Sierra Nevada Corporation’s glide tests of the Dream Chaser and parachute drop tests conducted by SpaceX. There is plenty of work to be done before any of them make their first flights with people on board, but the time to that milestone gets shorter every day. Author Steven SiceloffPosted on April 7, 2014 Categories Blue Origin, Boeing, CCDev2, CCiCap, Commercial Spaceflight, General, NASA, Sierra Nevada Corporation, SpaceX3 Comments on CCP @ 3: Happy Birthday!